The beginnings of the term User Experience, also known as "UX" are controversial, but it originated at some point during the '90's to describe the way a person feels about using a product or service. It's an enormous concept that quickly gets pretty confusing - how the same person would feel using a website back in 2006 is much different than how they'd feel today, due to the fact that technology is very dynamic. If writing code scares you, why should you care anyway? What's the problem with horizontal scroll bars? People know how to scroll, right? Well, as it turns out, there's plenty wrong. It's Weird. Most websites don't horizontal scroll. The space in your prospects' minds during their first website visit is precious and you don't want them focused on thinking "horizontal scrolling. That's weird." Space is Valuable. In the most-common resolution, a horizontal scroll bar takes up 1000 x 17 pixels - that's half the size of an average banner. You could advertise half an eBook in the space a scroll bar takes up. People Don't Scroll Down. The best web designers focus on getting all critical information above the fold, because research has indicated people don't always scroll down. Chances are, they're not going to scroll sideways, either. It's been said that the dirtiest word among user experience professionals is complexity. Why? Because complex things are often confusing, too. It's not that simplicity is necessarily superior, it's just that simpler things are easier to use. That's why Apple's renowned for the design of their iPod - nearly anyone can pick one up and figure out how to use it in seconds. If your website resembles an airplane cockpit or explosion of text and images, you're doing it wrong. This includes using too many fonts, too many images, too little white space or failing to format your text so it's scannable. Your website could be ranked #1 and still suffering a terrible conversion rate if your color is off. Color is a powerful small business branding tool, and poor contrast makes for a pretty terrible user-experience. People shouldn't have to squint or fiddle with their contrast to read the text on your web page. It's also important that your clickable text appears clickable. This one isn't too bad because the pop-up clearly resembles the web page behind it, so it doesn't damage the page visitor's trust. It's clear how you can close the pop-up if you're just not interested. People don't always mind being interrupted, as long as it's relatively easy to resume their activity. 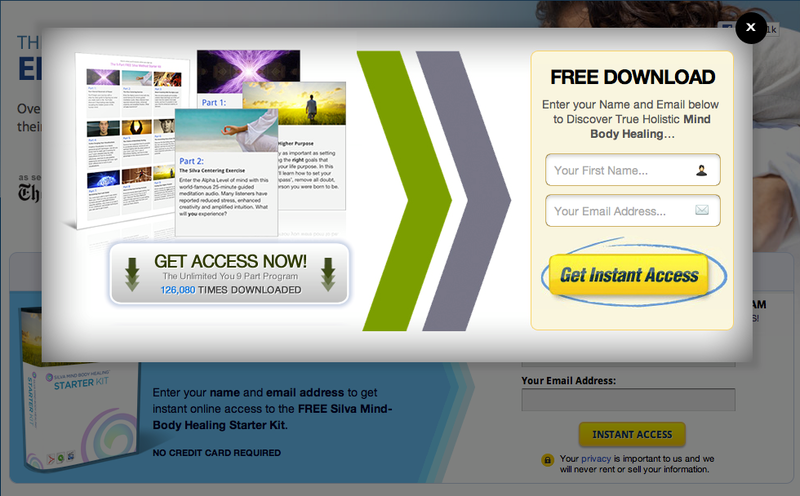 If your website has copious pop-ups and it's hard to close them, you're probably trying too hard. 52% of web users have said that a bad mobile-browsing experience makes them more likely to engage with a company's competitor. Failing to optimize your site for mobile phones and tablets is actually driving away your business! What's even more shocking is the fact that 78% of mobile users don't want to click more than once or twice to get where they're going on their smart phone. Your website needs to be clean, simple and ready for viewing on the go. Following the success of last week's post 7 Principles of Effective Web Design for People Who Can't Code, we're starting a series on the nuts and bolts of effective web design for small businesses. Tune in soon for coverage of graphic design basics and websites that convert!